This review was contributed to Death Metal Underground by Neil Sigmundsson. The best albums are greater than the sum of their parts and provide the capability for listener immersion due to their length and integration but the song is still generally the most important and most fundamental compositional unit in death metal. Paying too much attention to atmosphere, musicianship, individual riffs, or other aesthetical and shallow (though important) qualities of an album can lead to overlooking compositional shortcomings, especially after the mind starts to fatigue or when listening to dense material. This is the case with Doomed Passages, which feels convincing – and in some aspects it is – but suffers from a number of flaws that might be missed during casual listening. 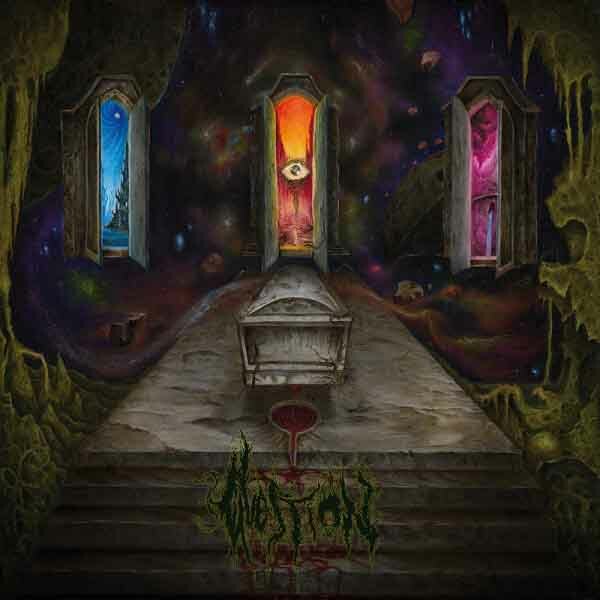 That being said, even though the music of Question is imperfect, it is modest and sincere and at its best moments overflows with contagious vigor and energy that leaps fearlessly towards the abyss, a mark of the upper echelons of death metal artists. First, praise is due to some of the mechanical and aesthetical elements of this album. The roaring, expressive vocals, replete with various single-syllable exclamations and grunts, are highly enjoyable and benefit from a cavernous quality due to studio-induced reverb. The drums are commendable in their creativity and in demonstrating a subtle understanding of the level of activity that best complements any given situation. Rumbling double bass creates a “rolling” sensation of high momentum at certain tempi. The production is deep and clear, and has a bit of cushion, but more separation between the instruments might have been beneficial. Aside from these two tracks, the remainder of the material on Doomed Passages shows promise and has shining moments but suffers from various problems. Some of these issues are abrupt transitions (“Mournful Stench” at 3:35), weak conclusions (“Devoured from Within”), and segments that overstay their welcome (the introduction of “…Bitter Gleam of Inexistence”). However, the major recurring problem and the biggest downfall of Question, though it is not immediately apparent due to the large number of riffs (many of which sound similar), is the purposeless, wandering song structures. In their template, Question take a single riff or a small group of riffs that act as an “anchor,” and they dance a bunch of ideas around that anchor before departing in an uncertain, random direction. This resembles a very relaxed version of what Slayer pioneered on tracks like “At Dawn They Sleep,” which completes two verse-chorus cycles and then departs radically from pop structure. The difference – and it’s a significant difference – is that Slayer maintained a strong narrative and a sense of purpose and tension throughout the entirety of their songs, whereas Question is usually content with wandering aimlessly. That Question can string a huge number of riffs together without the result sounding like patchwork is impressive (see “Grey Sorrow”), but cohesion alone does not make death metal of lasting quality, and as a result an appreciable amount of this material feels pointless and is frustrating to endure. As hinted at above, there are simply too many riffs on Doomed Passages, a large proportion of which are interchangeable and forgettable, appear only once, and serve no vital function. Question demonstrate that they know how to overcome this problem in multiple ways (developing phrases, relating riffs through common or similar phrases, writing highly memorable riffs, returning to previous ideas in different contexts, etc. ), but they need to apply these habits more diligently. There are focused passages, and there are highly memorable riffs, but ideally all of the passages should be focused and all of the riffs memorable and necessary. Thus, whereas many death metal bands have simplified their song structures to the detriment of the music, Question can actually benefit from being somewhat more repetitive in order to remove the forgettable and less evocative riffs and develop only their best and darkest ideas. This can be done while retaining the narrative, exploratory song structures. It will occurs more naturally and easily when the music is written and played with specific purpose and direction. More dynamics might also help in stressing important sections, as the sound sometimes blends into a monotonous stream. The digital, compressed production is of no help. Another lesser issue with Doomed Passages is that consonance sometimes feels out of place when it appears in the midst of the generally dissonant and chromatic music. The interlude “Through the Vacuous River” is the most blatant offender, though the riff at 5:28 of “Universal Path of Disgrace” is questionable as well. While consonance is not vital for this music to express something meaningful, there is potential in its skillful application, as demonstrated by 3:00-3:35 of “Mournful Stench,” a section that arises at an appropriate time but is unfortunately not fully developed. The acoustic final track also works fairly well in context. If Question would hone their skills at incorporating consonance into their musical language, the wider range of expression will provide them with more tools for communication. The standout songs on this album prove that Question is capable of writing intense and adventurous narrative death metal of the highest caliber. All of the tracks have redeemable and enjoyable qualities and marks of skilled craftsmanship, but most are hampered by the flaws discussed above. To further improve their already above average music, Question need to at least scrap the forgettable riffs and instead develop more extensively their best ideas while taking the reins and writing more directed and focused compositions. The second change can be realized either by forcing the songs to move toward clear climaxes and satisfying conclusions or by finding some wisdom and inspiration that can be represented in and communicated through the music. These young musicians are certainly technically proficient but need to write more coherent compositions if they want to inspirit their music instead of joining the ranks of so many other failed techdeath endeavors. Readers may listen to Doomed Passages on Chaos Record’s Bandcamp page. 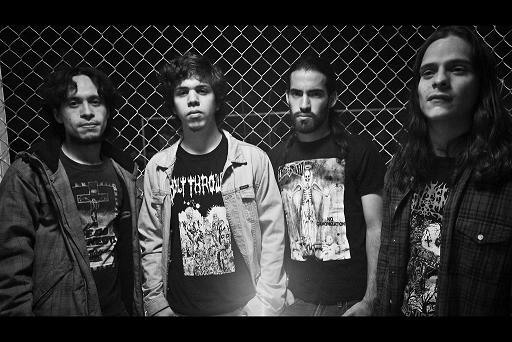 Question come from Querétaro, Mexico and create technical death metal in a combination of old school styles. Their debut album Doomed Passages saw release through Chaos Records in early June. Question deliver a very spacious style of death metal reminiscent of The Chasm with some Finnish touches. The guitarist, Rodrigo, agreed to talk to us about the band. Question caught my eye as an unusual name for a death metal band. What made you choose this name? “Question” is a name which is coherent with the philosophy of the band and the lyrics; it’s consistent with the context that we want to portray. A friend came with the idea and we thought it fit perfectly with the music that we were composing at the time. It’s not surprising that some think it is a weird or dumb name; you’ll always find people that keep looking for the most rude or evil names, but I think that has become a weak point with the past of the years in the metal scene. I detect a strong Finnish death metal influence on Doomed Passages. Would I be correct? Well, we are fans of some early Finnish death metal bands; also we listen to some contemporary bands that have been spreading rottenness lately. However, it’s more appropriate to say that we’re heavily influenced by obscure death metal in general; Mexico has a lot of obscure metal bands and some of them are big influences for us. Also, besides metal, we listen to a lot of punk, progressive rock, etc. What drove you to create death metal? Curiosity. In terms of composition death metal has a very vast spectrum of possibilities and we all are very into obscure, heavy and strange stuff, not just music, also books, films, so I guess it’s natural to feel a tendency to create and play this kind of tunes. Is art separate from entertainment or are they one in the same? I’m afraid I’ve never established a delimited frontier between these two concepts; any attempt to be objective will fail, however I can resume my thoughts with the following: many expressions of art can be entertaining, but entertainment mostly lacks art. Art is an intimate vision of an artist, and sometimes the vision is shared with some people. In contrast, entertainment is made for the masses, is a guided story that leads to a guided conclusion. Art is more subjective, it makes you think what you’ve experienced. Tell me about the recording process of Doomed Passages. We recorded the album in April 2013 at Oz Recording Studios in Mexico City. The process lasted five days and it was the first time for the actual lineup to record something. All went well, the studio is amazing, and we had a really good time, although the mixing and mastering process was more exhausting, as we couldn’t make a connection with Roberto Granados. I think the result is good. What does the artwork on Doomed Passages signify and how does it tie into what is being expressed musically? Hector and I wrote a couple of ideas for the artwork based on the lyrics and the band’s philosophy. We send this to Arturo Vargas and he came with this spectral vision that became the cover of our first album. The significance is relative; art should not be restricted to a single interpretation.